This is almost a true "no knead" recipe: the wet and dry ingredients are simply mixed well, and that's it! A very popular no-knead recipe was published in 2006 in The New York Times [pdf], but it is for plain bread, made only with regular "white" bread flour. Such recipes also require a 2-step rising of the dough, and yes, still some hand-kneading. Unlike the standard way of baking bread, there is no need here, to inject water or steam into the oven to get a nice crust! Initial baking is done with the lid on the casserole. This has exactly the same effect, by using the moisture that's in the dough! I wanted a truly no-knead bread, and not plain, but "multi-grain/whole-grain". 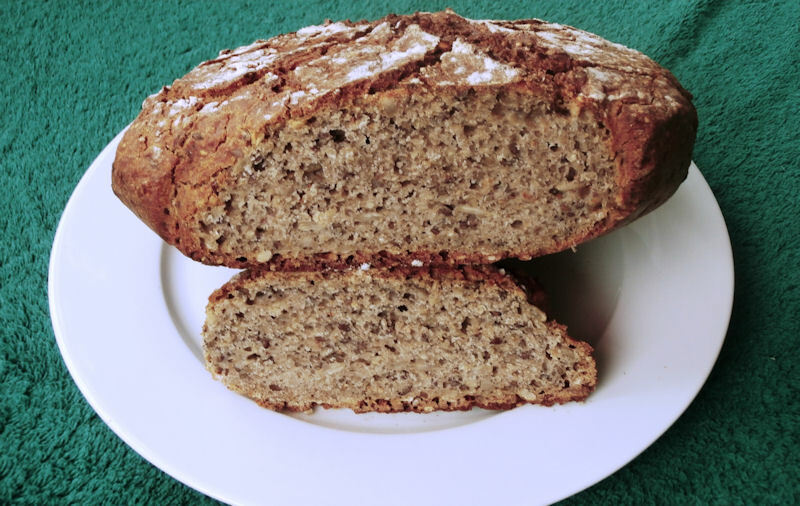 I have looked at a bunch of related recipes, then tried out over two dozen different combinations of flour types, grains, and seeds. I have settled on the combination presented below. The bread is tasty, quite dense, and has a good crust - the way I like it! Cook/bake time: 90 minutes + 30 minutes pre-heat. ©2012-2018 F. Dörenberg, unless stated otherwise. All rights reserved worldwide. No part of this publication may be used without permission from the author. 220 grams all-purpose flour (France: farine de blé T-55, Germany: type 550). 400 grams all-purpose flour (France: flarine de blé T-65, Germany: Weizenmehl Type 812 or 550). 100 grams whole-meal wheat flour (France: farine de blé complet/intégrale T-150, Germany: Weizenvollkornmehl Type 1600). 30 grams whole-meal buckwheat flour (France: sarassin T-130, farine de blé noir T-130; Germany: Buchweizen). 120 grams parboiled whole-kernel oats or (durum) wheat (France: blé dur complet, blé mondé précuit). In a pinch, use steel-cut oats (whole-grain oat groats that are cut into 2-3 pieces; France: gruau irlandais, avoine coupée, avoine épointée; Germany: Hafergrütze). 60 grams green pumpkin seeds (France: pépins verts de courges; Germany: Kürbiskernen). 60 grams flax seeds (linseed; France: graines de lin; Germany: Leinsamen). 60 grams raw, hulled, unsalted sunflower seeds (France: graines de tournesol; Germany: Sonnenblumenkernen). 60 grams hulled millet (France: millet décortiqué; Germany: Hirse). 1.5 teaspoons (9 grams) fine sea salt; this is almost 1.5 % of the total flour weight - do not exceed 2%! 2 teaspoons (8 grams) active bakers yeast granules (in France, I use "levure du boulanger" of the "Briochin" brand). 610 ml (610 grams) luke warm water. Note: non-clumping flour (France: farine fluide) typically contains additives and may require a bit more water. 2 tablespoons (30 ml) white wine vinegar or apple cider vinegar. 2 teaspoons (10 ml) dark sesame oil. Heavy cast-iron casserole ("Dutch oven"). I use a round "Le Creuset" with 24 cm diameter (≈9½ inch). A kitchen machine with a dough-hook. I use a medium size Kitchenaid (325 watt, model "Artisan"). Small size bowl (3/4 liter, 1 quart), for the dry ingredients. Small size bowl (3/4 liter, 1 quart), for the water and vinegar. Measuring spoons/beaker: teaspoon ( = 5 ml), tablespoon ( = 15 ml), 1 cup ( = 240 ml), 1/2 cup (= 120 ml). Always use official measuring spoons, not a teaspoon or tablespoon from the kitchen drawer! Even flour with non-clumping additives does clump! Do not use a flour sifter: it will get clogged with whole-grain flour, and the mesh will be hard to clean. Sieve (D: Abtropfsieb, F: tamis). 30x40cm (12x16 inch) thin non-stick PTFE/teflon baking sheet. Round colander (preferably shallow; D: Abtropfsieb, F: égouttoir, passoire); mine is about 22 cm in diameter (9 inch). Some vegetable oil, for greasing the spatula. Sharp, thin kitchen knife (paring knife). Oven mitts or pot holders. Wire rack (cake rack / cooling rack). Slowly boil the whole-kernel oats in water (30-45 minutes, depending on whether precooked or not), then drain well (use a sief) and let cool for a couple of minutes. Combine the four flours and the yeast into the bowl of the kitchen machine. I put the large bowl on the kitchen scale, re-set the indicated weight to zero with the "tare weight" function (standard on all electronic kitchen scales), and re-zero each time before I add the next ingredient. Whisk the flour until all the clumps are gone and all ingredients are well mixed, then install the bowl in the kitchen machine. Whisking is much faster than using a sifter and also much easier to clean! Add the seeds, grains (incl. the boiled oats), and salt to the flour and mix well with a large fork or the wire whisk. Drizzle the sesame oil over the mix. Measure 550 ml (2 cups + 5 tablespoons) of lukewarm water, put in the medium size bowl and add the vinegar. The remaining 60 ml (4 tablespoons) of lukewarm water will be added if necessary, and one tablespoon at a time. Quickly pour the water-mix onto the flour, in the middle of the large bowl, and immediately fully mix all ingredients with the dough hook for 3 minutes on low speed (speed level 2 of 5). Some dough will be sticking to the inside of the bowl. Once a minute, stop the machine and scrape it all the way down with the spatula. Make sure you get all the flour underneath the dough mass!! The dough mass should be quite soft, wet, sticky, and slowly fall of the dough hook when you lift the machine out of the bowl. This will not be the case with the initial amount of water. While the machine is turning, add 1 tablespoon of lukewarm water until fully incorporated. Briefly speed up the machine (to speed level 3 or 4 of 5). Add more tablespoons until the desired consistency is achieved. You may not need all 4 tablespoons. Let rise 2.5 hrs at least at room temperature (21 °C / 70 °F). Rising is faster at higher temperatures (but stay below 28 °C / 82° F), however, a slow rise typically results in more taste. Small holes will form at the surface of the dough; there will be small crackling noises. Put the bowl back into the machine and slowly knead with the dough hook for 30 sec. Cover the bowl again with the plastic wrap, and let rise another 2.5 hrs at room temperature. Knead the dough one more time for 10 sec. Cover the inside of the colander with the baking sheet. 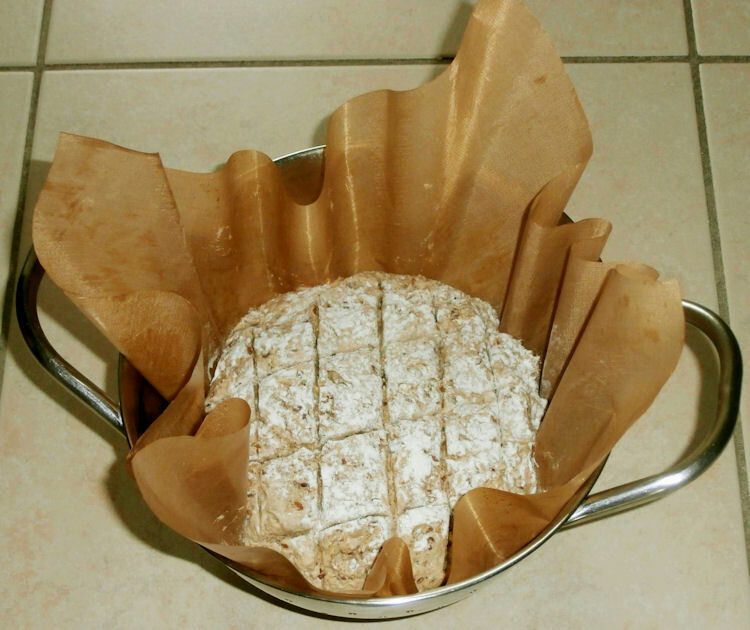 If you are using baking parchment paper: brush the top-side of the paper lightly with vegetable oil. Take the plastic wrap off the bowl, and separate the dough ball all the way around from the wall of the bowl with a spatula that has been brushed with vegetable oil (you probably have to re-oil a couple of times as you go). Transfer the dough ball to the lined colander - this is the most difficult part of the recipe - and cover the surface of the dough with plastic film. Place the empty casserole + lid onto the lower rack in the oven, turn the oven on and set the thermostat to 210 °C (410 °F). Optional: lightly flour the top of the dough with regular flour. With the sharp knife, make 1-2 cm (≈½ inch) deep parallel slits across the entire top of the dough. You can also make slits in the cross-direction. Briefly remove the casserole from the oven (close the oven door!!! Be careful not to burn yourself) and remove the lid. Quickly pick up the dough ball by lifting it out of the colander by the baking sheet, and transfer it to the casserole. Put the lid back onto the casserole, and put the casserole back into the oven. Set the kitchen timer to 30 min. Remove the lid from the casserole. Make sure that the oven's circulating fan is OFF! If not, put back into the oven for another 5 minutes and check again. Baking it for 5 more minutes will raise the core temperature by another 2-3 °C (≈ 5 °F), without charring the loaf. Let cool for at least (!!) 45 minutes before trying a slice! Enjoy! 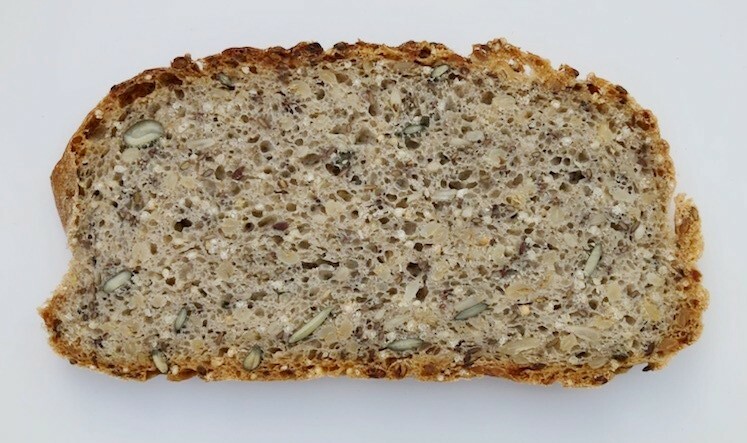 If the bread is too dense for you, then reduce the amounts of whole-grain/whole-meal flours (e.g., by 10 grams each) and increase the amount of white flour (e.g., by 15 grams). Standard white flour requires less hydration, so you will have to reduce the amount of water (e.g., 1 tablespoon). Experiment! 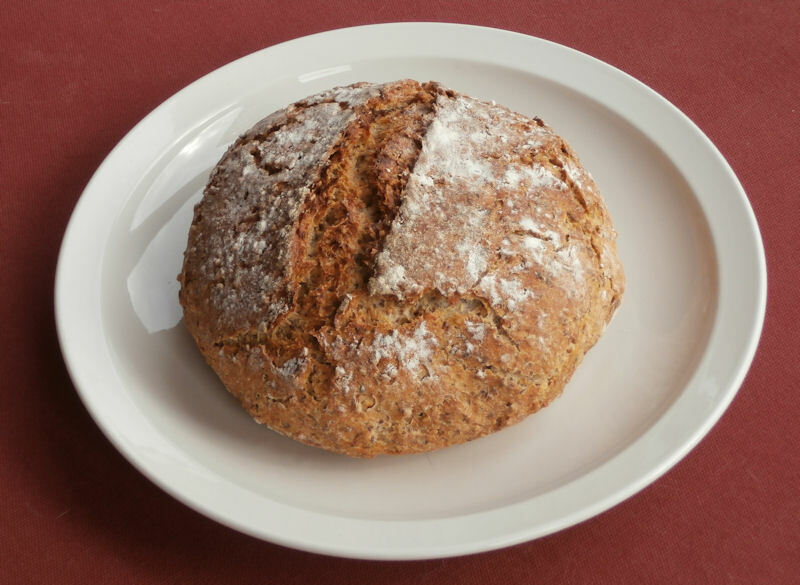 Spelt and buckwheat flour have less gluten than regular flour, so they make the bread more dense. The amount of water required depends on the age of the flour, humidity of the air, the alignment of the planets, etc. You will have to get a feel for this, and adjust as necessary.